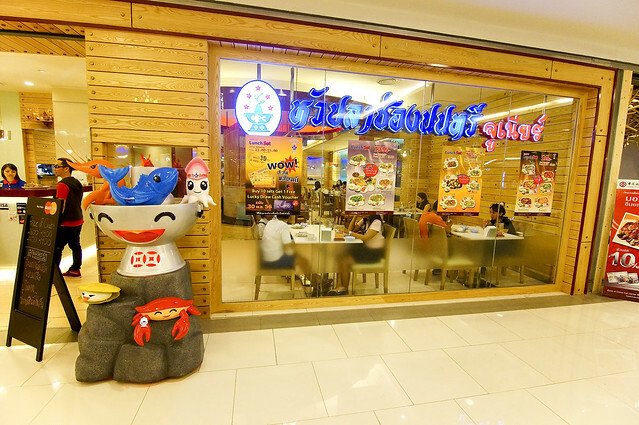 My must-eat for Huaplachongnonsea will be their signature Hot Pot Tom Yum Soup (they even use the hot pot in their logo) , Roasted Pork Cheek and the highlight – Thai-style Curry Crab Meat! Surprisingly, i didn’t manage to get a really good Tom Yum Soup in Bangkok. 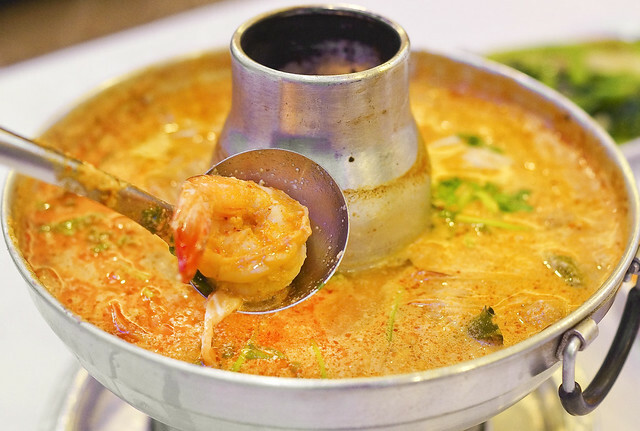 If you do have a good Tom Yum Soup recommendation in Bangkok, feel free to share! I heard Ban Khun Mae and Nara Thai serves pretty good Tom Yum Soup. But this Hot Pot Tom Yum Soup from Huaplachongnonsea manage to satisfy my craving for a good soup! This is the coconut milk version and note that it is slightly oily. 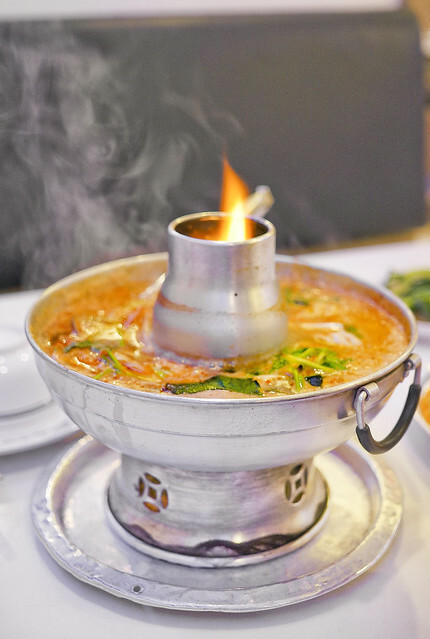 So what is better than a pot of spicy and sour Tom Yum Soup? A pot of piping hot, spicy and sour Tom Yum Soup!! I’ll definitely give my vote to Huaplachongnonsea for the most satisfying Tom Yum Soup in Bangkok till date. Large portion, big fresh prawn, piping hot soup, flavorful, spicy and spices infused Tom Yum Soup, and at a reasonable price of 270 baht! This is one disappointment for me as I was expecting a char-grilled pork cheek with a little burnt on the surface but there isn’t any. This pork cheek has a tinge of sweet coconut taste which don’t exactly enhance the taste in my opinion. This also has something to do with the way the chef cuts it, which makes the pork cheek rather tough on the teeth. 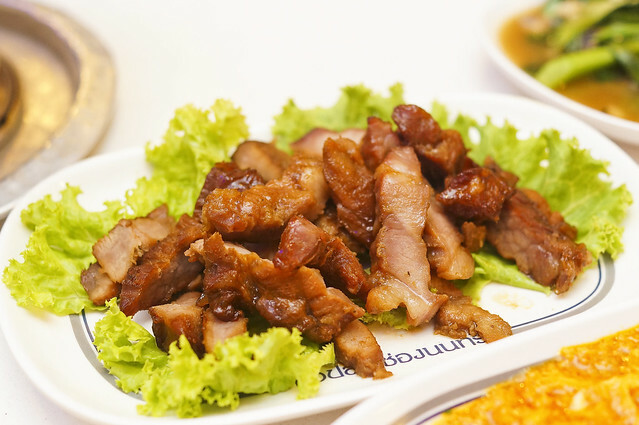 I thought a good way of preparing the pork cheeks is to slice them into thin slices. Best Kai Lan dish ever! But provided you like salted fish. The whole dish is overpowered with the aroma of salted fish which makes it rather salty and goes very well with white rice. I can finish the whole bowl of rice with just the vegetable alone. But a word of caution, this dish is really salty, but in a way that I favor. 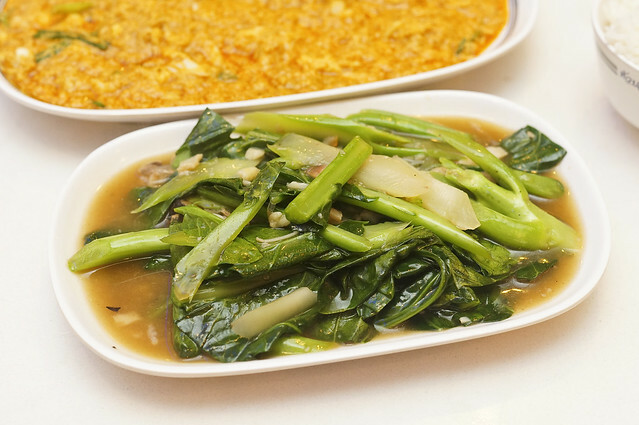 This is my favorite dish of Huaplachongnonsea. We have chilli crab in Singapore and the Thais have curry crab! 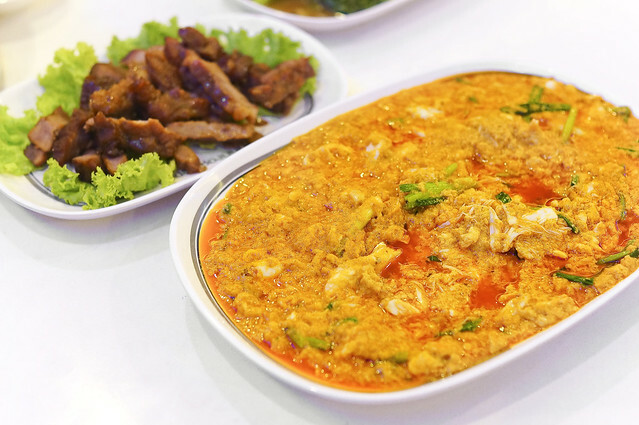 I did a search on instagram for this restaurant and apparently this is one of the most popular dishes in Huaplachongnonsea, which i made this a must-order for my visit. Like the Hot Pot Tom Yum, this cost about 270 baht if i remembered correctly. Best thing I like about this dish is – there is no need to de-shell the crab as the kitchen had already removed all the shells and stir-fry chunks of fresh crab meat into their special curry gravy. How I wish I have some fried man tou (steamed bun) to go with it. Some may find this dish a little too oily but I heck it since it’s an overseas trip and won’t get a chance to eat this when I return to Singapore. Like how we Singaporeans say it – “Just whack only!”. I will be back for more of this. I looked around Huaplachongnonsea and noticed there are not much foreigners in the restaurant. Almost all the guests are locals. Actually even for me, if I don’t already know this place, I probably won’t set foot into this place as there are just too many other tourist-friendly-looking restaurants at Central World. 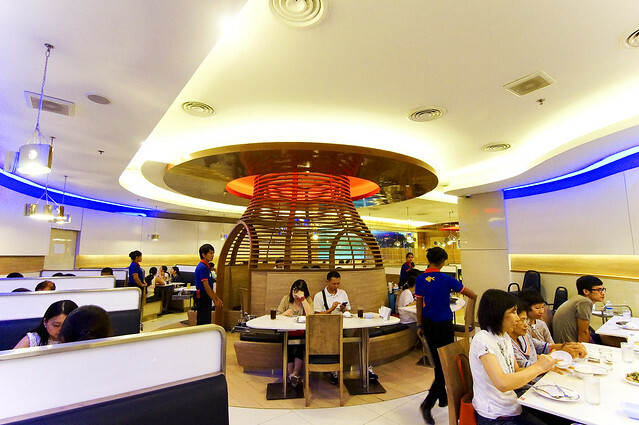 The total damage is about S$36.00 for Hot Pot Tom Yum Soup, Roasted Pork Cheek, Curry Crab, Salted Fish Kai Lan, Rice, which is reasonably enough for four people. 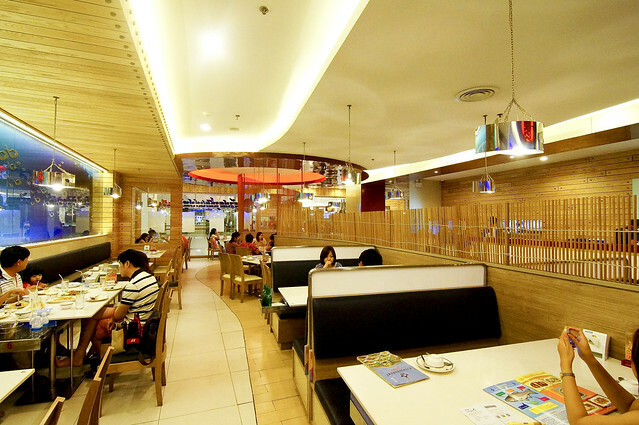 The price seems pretty reasonable for a restaurant located at Central World. If you ask me, I will visit this place again for their Curry Crab Meat and Hot Pot Tom Yum Soup and and other dishes as well.